Search Indie is the perfect platform to explore and discover Indian Restaurants, Shops, Dance School, Temples, Yoga Studios, Indian Events happening any where in Europe! Search Indie is Europe's largest platform for Indian Businesses and Events. 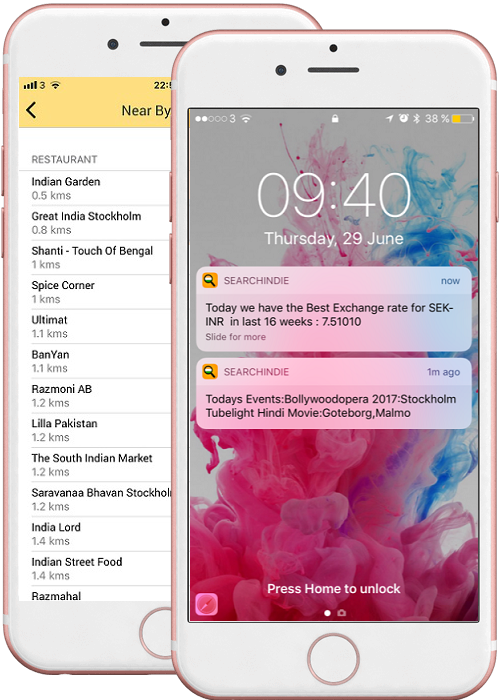 Whether you are living in Stockholm, Paris, Amsterdam, Berlin you just need Search Indie to discover Indian Restaurants , Shops , Events. Our Smart Notifications will intimate you about Events, Exchange Rates, Top News. Be it Amsterdam or Stockholm or Paris , Search Indie identifies Restaurants, Shops, Events Nearby you. We took years of research to develop the best features you as an Indian expat look for. Explore the best Indian Restaurants, Shops in your City. You can Email, call the business directly from the App. You can also write Reviews about Restaurants, Shops. Listen to 100+ Indian Radio stations in 9 different languages from India and around the world through the App. Read News from 1000+ News agencies from India and around the world through the App. Our Smart Notifications will keep you updated about the most Trending News of the hour. Find out the details of Indian Events happening in your City and book directly from the App. Nearby feature will find the nearest Restaurants, Shops while you are on the go.